Ok, having a stress free family vacation might be a stretch but reducing the stress is definitely possible. I’ve made my share of rookie mistakes when traveling with my kids but I’ve learned a lot along the way. Things that have helped make traveling easier and allow for an almost stress free family vacation. I can’t promise your travels will be stress free but these tips and tools may help when the world is on the verge of melt down mode. Kids are gross. They touch everything. Of course I think mine are the worst. They eat crackers off the bathroom floor. They touch every surface, from the floor in the parking garage to the toilet seat on the airplane – and then put their hands in their mouth. It’s amazing to me they haven’t contracted some rare awful disease. I used to find myself repeatedly scolding them for touching everything. I sounded like a broken record. It wore me out and drove me crazy. I finally accepted my kids are gross (and they won’t contract a rare awful disease by licking the tray table). Instead of being crazy germ mom, I just carry a small bottle of hand sanitizer and have them clean their hands once or twice throughout the day. Hand wipes are also a Godsend… I do still kinda freak out when they eat a cracker off the airport bathroom floor. That’s just disgusting. Talking to your kids in advance about the trip and things you’re going to be doing helps set the stage for the what’s next in your child’s mind. For instance, if your kids have a special animal, blanket or lovie, getting through security will be a lot easier if you warn them they will need to part with it for a few minutes at the airport. I learned this the hard way when my daughter was two. When it came time to have her doll go through the “tunnel” with my shoes you would have thought the world had come to an end. We survived and the ear piercing screams came to an end… Now, the girls make a game of going through security, telling me stories about what their dolls saw in the tunnel and where they went. 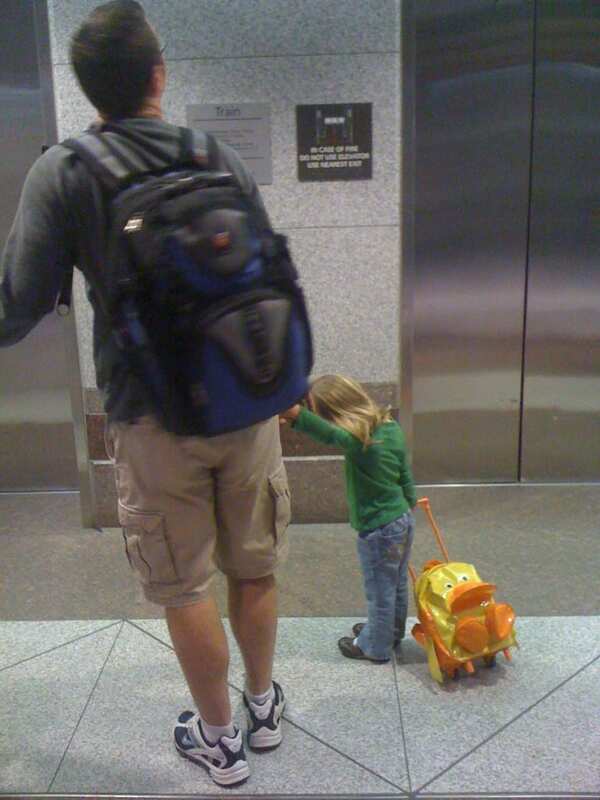 My husband is a business traveler who buzzes through the airport at the speed of light, but with kids, especially little kids, you can’t do this with as much ease. It’s important to make sure to give yourself enough time…for everything. From packing, getting to the airport, parking, walking through the airport (and all the potty stops) and getting onto and seated on your plane. 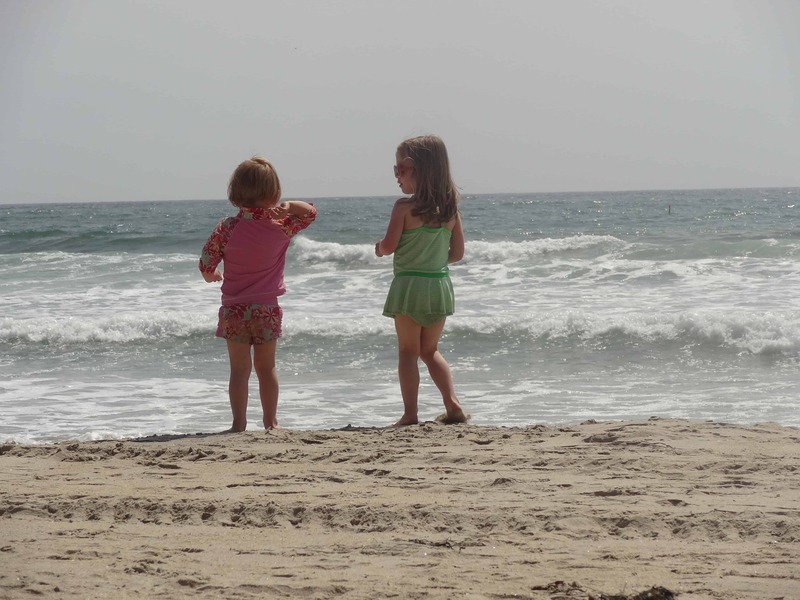 The first time I traveled with my kids and no stroller I felt liberated…and terrified. I had come to rely on the stroller and backpack as a way to control my kids. Not control them in a bad way, but mange where they explored, eliminate the “I’m tired of walking” complaint, and erase the fear of losing them in a crowd. But life with a stroller and backpack carrier does come to an end…but managing their exploration and complaints doesn’t. Depending on your kids ages and size you may consider investing in the Trunki. Not only is this a good tool to limit the “I’m tired of walking” complaint, but it also gives kids an activity/toy to play with as you make your way through the airport. The Ride On Carry On is a fun alternative for little ones who don’t tire out easy. 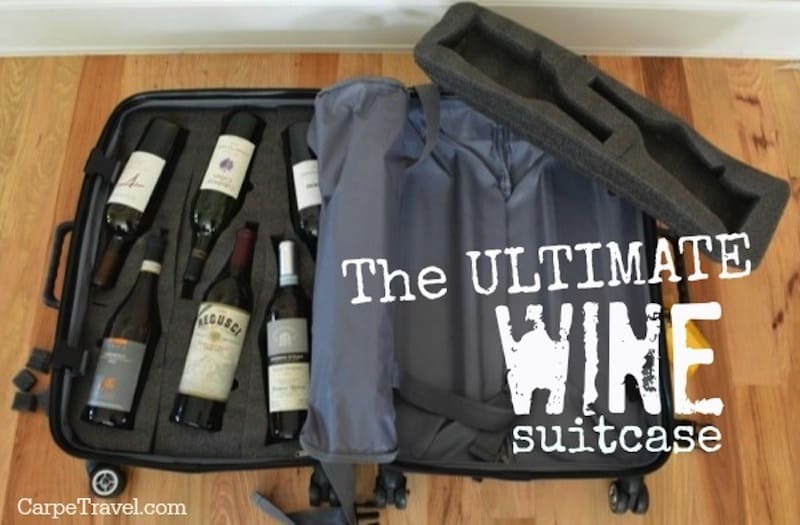 Its essentially a folding chair that attaches to your carry-on. Being armed with plenty of snacks can mean the difference between a good day or a bad day. Literally. It’s not enough to have snacks on the airplane or car ride, you need to plan to have them with you when you’re out exploring on your vacation. Consider what activities you’re going to be doing, how physical they are, the time of day, and when your child typically has a snack. Packing a few extra bags of Gold Fish crackers, filling a zip-lock with dry cereal or grabbing a banana from the breakfast buffet and keeping them your purse (or child’s backpack) can literally save the day. Be flexible with your rules. Bedtime may be a little later. Desert may happen every night instead of just on Friday. Bending some of the rules can be a treat for kids on vacation… I typically try to limit the amount of TV and screen time my kids have but when we travel that rule is tossed aside – at least when it comes to being in transit. Movies and apps on the iPad have become essential necessities in keeping everyone sane – and entertained – on the airplane or a road trip. The screens, however, are packed up when we get to the hotel and rarely pulled out until we’re heading home. It’s hard enough to get kids to eat at home so why would it be any different when you’re traveling? I’ve found that once we reach our destination I just let them eat what they want. That’s not to say they can eat candy and cupcakes all day. But they can have butter noodles and mac and cheese for every meal if that’s what they’ll eat. I used to worry about not getting enough veggies and fruit, or if they drank their milk. Now, if they eat I’m happy. As they’ve gotten older – all of five and seven – they’re more open to trying new things but when they were younger I found having similar foods found at home was what they preferred. 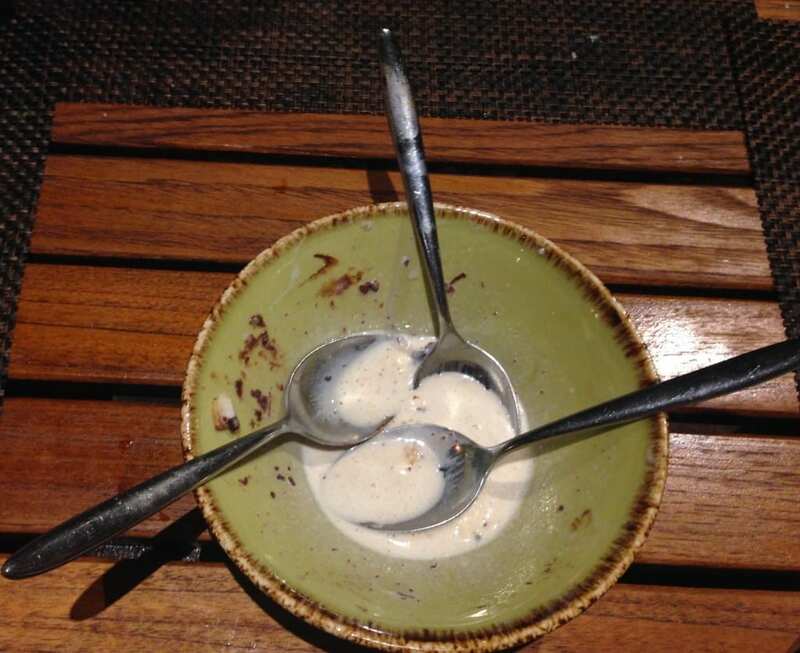 They weren’t able to explain it to me but eating something comfortable – aka food they know – helped ease their fears when they’re away from home. If you’re traveling out of the country this rule really applies since food can be so different than what they’re used to at home. It’s easy to map out the activities for your trip in advance and get everything set up so you’re ready to hit the ground running. However, polling your kids for their opinions before you set things up ensures everyone has a say and feels included as an equal participant on the trip. This doesn’t mean they’re in charge but you may find they want to do things you hadn’t thought of, avoid things they absolutely do not find interesting or better yet, do things that are less costly than you had initially planned. I know, there’s so many things to see and do in such a short amount of time so you feel you have to cram it all in. You’re on vacation. Relax. No one is going to appreciate the trip if your schedule is so tight and your kids are melting down from being on the go and over stimulated. I’ve found that planning one or two activities a day is perfect. The best days have been when we do something in the morning and then head back to the pool or beach in the afternoon with no agenda for the reminder of the day. The kids appreciate – and enjoy – the trip so much more since they’re not always on the go. Want to sleep until noon? Tour the museum after lunch? Walk around the city and just see what happens? Forget about it. When you’re traveling with kids – at least younger children – you’re up by 7am (if you’re lucky! ), and ready to hit the ground running by 8am only to wrap up for nap time mid-afternoon. Setting your expectations before the trip is a must. What is it you want to do? What does your partner want to do? Discussing these things in advance and working them into the trip allows you to do a few of the things you each want to do, but you have to remember it’s a family vacation. Be prepared to see and do thing through the eyes of your child. If you do, you’re bound to have a blast. You can’t always leave the laptop and work at home but removing the layer of stress from the office allows you to focus on your family and create memories you and your kids will treasure. If you do have to work while you’re on vacation, pick a day and/or time each day that everyone knows is your dedicated time to work. Then try to stick with that time allotment. 12. Most Importantly – Just do it. Don’t let traveling with your kids scare you. Don’t let the fear of it make you not travel. The stress might turn you from a nice, well-groomed woman to a crazy lady with hair flying all around once in a while BUT, and it’s a big BUT, it can be done. It should be done. You and your kids will both grow from the experience and often times grow closer together because of it. 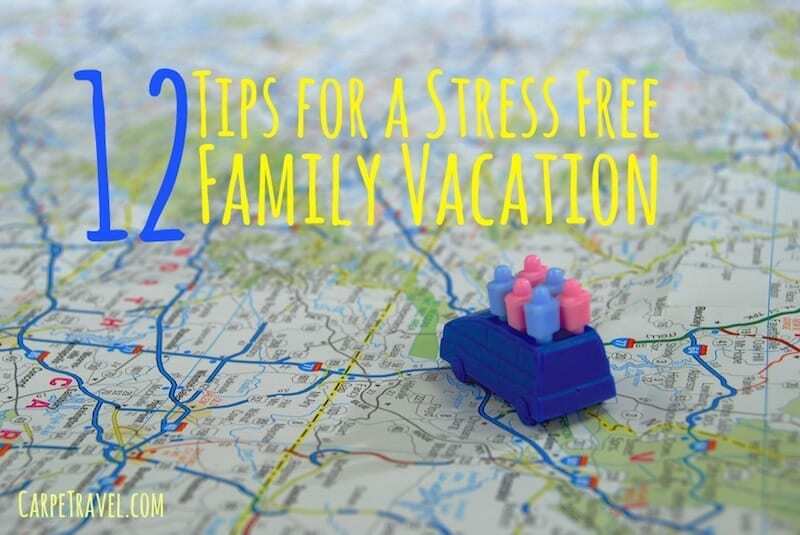 What are some things you’ve found that have helped you have a stress free family vacation – or an almost stress free family vacation? My family and I traveled together a lot when I was younger, and at times we still do. Communication is so important and finding/planning activities ahead of time is so helpful. We all like to do different things, but it seems like if we compromise and do one thing each person wants, we’re all happier. Traveling with family can be complicated, but it’s possible to make it enjoyable for everyone. Yes soooo true… Thanks for stopping by! One of the things I’ve learned is often the difference between a good trip and a challenging trip with the kids is time. If you plan to give yourself extra time to do anything, you’ll keep the pressure and stress levels low.